One of the greatest historical cocktail destinations to be found, New Orleans has been the birthplace of many a classic compound: Sazerac, the Vieux Carré, Ramos Gin Fizz, Grasshopper, the list is endless. 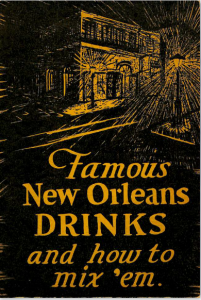 Written by journalist and Louisiana historian Stanley Clisby Arthur, Famous New Orleans Drinks and How to Mix ‘Em is a delightful travel guide to not only New Orleans creations and variations, but to some of the exports that arrived from another nearby landmark drink centre: Cuba. This is the third edition of this well-loved tome. Next to the Tchoupitoulas Street Guzzle is the Cuban Rainbow Pousse Café as it was served at Sloppy Joe’s in Havana. We think you’ll find the recipes for the Daiquirí and the Barcardí Cocktails on page 60 eye-opening.